again...i got this even 'righter'. 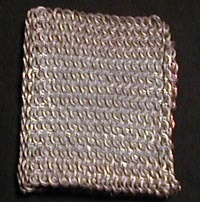 the last wallet was slightly flimsy and the maille was slightly too weak. 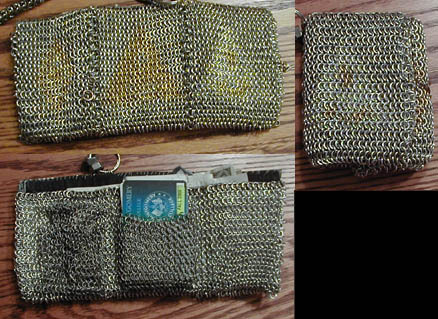 to fix that, yet still keep the weight down, i used heavy leather for the outside, and only coated the outside of the wallet with maille. the maille was also TI and 5356AL in 3/16"id. I think i finally got it very right this time, this is by far the best and most functional wallet i made. There is no inlay on it because brass, bronze, etc add lots of extra weight. The liner is made from leather. The chainmaille is 5/32id", .035 5000 series aluminum and 308L stainless. I also threw a grommet into the leather so i'd have a place for my wallet chains where they wont rip off a ring every two weeks. Not the best pictures here, but this was given to my mom for a friend of hers so these pics will have to do. Its made from 5000 series aluminum with a bronze trimming. This is my newest wallet, its made out of 5/32"id links which were: aluminum (electric fence wire), aluminum (5000 series), brass, stainless steel and soldered nickel links. The inlay which is kind of hard to see is a Fnord, then the negative of the Fnord (brass and 5000 aluminum were reversed). The other inlay is just a fun diamond thing. 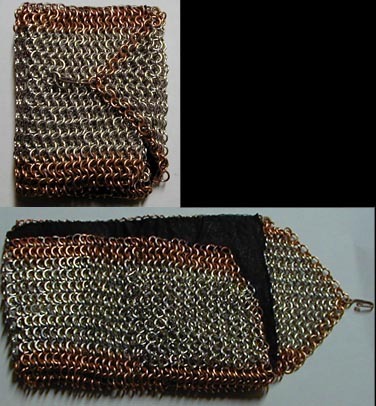 This wallet was made out of 3/16 and 1/8id stainless and copper alloyed steel (17 and 21ga). 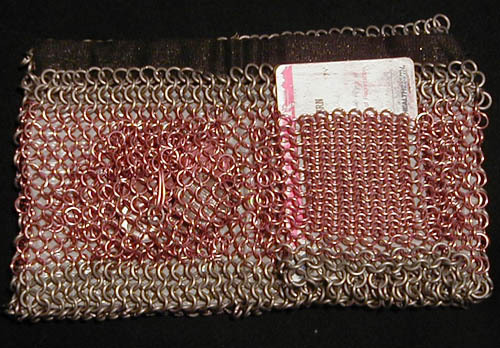 (the first wallet is the functional one made from 3/16id rings--it took forever to make).